Sh. B.K. 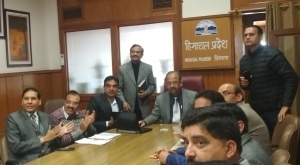 Agarwal, Chief Secretary, Himachal Pradesh launched the Traffic Management mobile App on 22nd December 2018 at Shimla. Sh. Manoj Kumar, ACS Home, Health, Sh. R.D. Dhiman, ACS Forest, Personnel, Sh. Probodh Saxena, Principal Secretary, Power, UD, TCP, Sh. Onkar Chand Sharma, Principal Secretary, Agriculture, Food, Dr. R.N. Batta, Secretary to CM, RD, PR and many Heads of Departments were present at Shimla. All Deputy Commissioners participated through Video Conferencing. The Chief Secretary appreciated the fact that the App has been developed by NIC in a very short time due to the urgency of Honorable Prime Minister's proposed visit to Dharamshala on 27th December 2018. A demonstration of the functionalities available in the Mobile App was given by Sh. Ajay Singh Chahal, SIO NIC HP. The objective of the App is to record the number of vehicles and people visiting Dharamshala on the day of visit from different places of about 10 Districts. The App records the start time, location, vehicle and people details and these are verified at various entry points. Finally, all the vehicles will be parked in 15 different parking slots based on entry points. Sh.Sandeep Sood, HoD, NIC Competency Centre for Mobile Apps and Sh. Shailender Kaushal were present. Training for liaison officers is being held at District Headquarters on 24-Dec-2018. The App is available in both iOS-Apple and Android platforms. It will be used by the Deputy Commissioners, Nodal Officers, Police officers, Parking Officials and Liaison officers on 26 and 27th of December 2018 to get the estimated figures of vehicles and people entering Dharamshala to make necessary arrangements.